Den of the Wererats is a two-player Dungeoneer card game. Your character explores a city that you build with map cards, while fighting monsters, completing quests, and leveling up along the way. Each Dungeoneer set can be played as a stand-alone card game, or combined with other decks for more dungeon-delving fun. 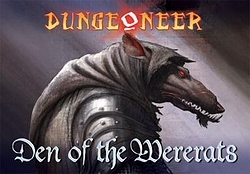 Den of the Wererats features 55 new Dungeoneer cards, including city maps, lycanthropic curses that transform your opponents, and three new heroes for your Dungeoneer game: Darkling Thief, Human Alchemist, and Dwarf Guardian.